FOMC: Fishing, Hiking, or Whitewater Rafting? With the FOMC wrapping up its two-day policy meeting today and the market pricing in as near a certainty as it can that there will be no change in rates, the committee is either gearing up for a big surprise to the markets when it releases its 2PM statement today or doing a whole lot of nothing trying to fill the time. Not only today, but for the next several meetings, market expectations for Fed policy anticipate little in the way of movement for the Fed Funds rate. 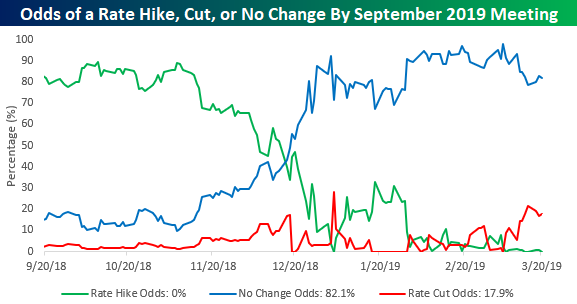 The market is currently pricing in no chance of a rate hike between now and the September meeting and an 18% chance of a rate cut. If the market is right (which isn’t always the case), the FOMC will have to find things to do to fill the time at the next few meetings. Maybe they can nail down plans for the late August KC Fed Jackson Hole Economic Policy Symposium. While there’s obviously no skiing in August, it’s hard to match the fishing, hiking, and whitewater rafting at that time of year!